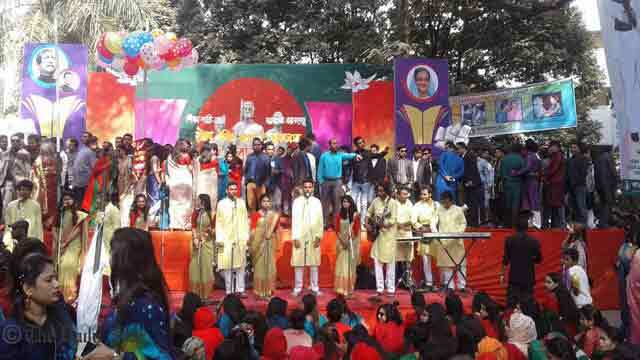 Dhaka, Jan 6 (Just News): Dhaka dwellers have been suffering in the gridlock created due to a joy rally brought out by Bangladesh Chhatra League (BCL) activists marking its 70th founding anniversary from Dhaka University campus this afternoon. “Vehicles are moving very slowly on the Banglamotor-Matsya Bhaban road for more than one hour since 12:30pm creating traffic jam due to a huge rally brought out by BCL,” Md Shamsujjaman, assistant commissioner (AC) of Ramna Zone Traffic Police told. The rally began at 12:30pm from the university’s Fine Arts building and will end at the BCL party office at Bangabandhu Avenue after going through Matsya Bhaban, Kakrail and Paltan of the city.